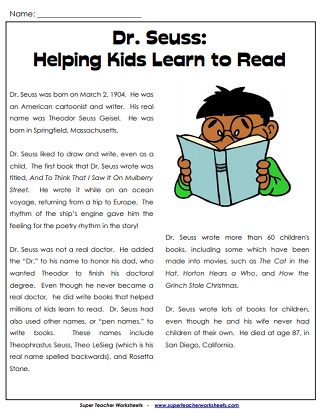 Dr. Seuss' birthday is on March 2nd. Celebrate the life of this renowned childrens book author in your classroom. We have a biography of Dr. Seuss, worksheets, and a word search. Write the name of your favorite Dr. Seuss book on the line. Then tell why you like it. Draw a picture of the book's cover. Can you complete the names of the Dr. Seuss books? Use words from the box to fill in the missing parts of each title. Cut out the simple Seuss rhyming words - fox, socks, box, rocks, clocks, knocks, and docks. Glue them onto the hat in ABC order. Cut out the Dr. Seuss book titles. Arrange in ABC order, glue, and color. This is an intermediate worksheet because some book titles begin with the same letter. Cut out the letters in the words CAT IN THE HAT and rearrange them to make new words. This primary-level activity is designed for students in grades K-2. Cut out the letters in the words CAT IN THE HAT and rearrange them to make new words. This intermediate-level activity is designed for students in grades 3-6. This Seuss-inspired picture has a cat, riding upside-down on a unicycle while carrying a birthday cake. Color the Seuss-inspired picture of funny cat, riding upside-down on a unicycle. Cut out 25 word cards. 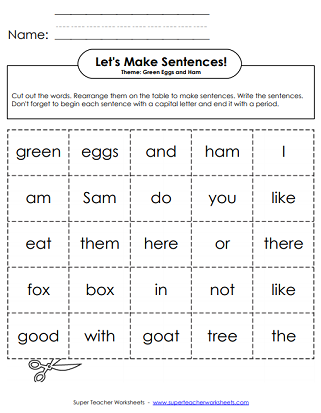 The cards have basic sight words from the book, Green Eggs and Ham. Words include green, eggs, fox, try, box, and mouse. Students rearrange the words to make as many sentences as possible. Students cut out the words, rearrange them to make a sentence, and glue the words onto the paper. The sentence says, "I like to read Dr. Seuss books." Read all about the life and works of Theodore Seuss Geisel. This passage was written at a 3rd or 4th grade reading level. There is also a page of reading comprehension questions to answer at the end of the passage. 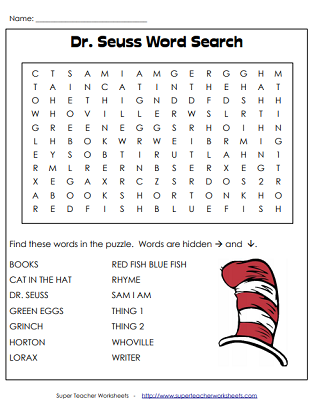 Can you find the words and phrases related to Dr. Seuss hidden in the puzzle? Students will need to search for Lorax, Horton, Grinch, Whoville. Easter will be here before you know it! Try these printable Easter worksheets in your classroom. See the complete list of holiday worksheets available on Super Teacher Worksheets.